During the holiday season, the alcohol seems to flow freely. Office parties, family gatherings, and the actual holidays themselves keep you busy and your cup full of many different drinks. Combined with more stress than other times of the year, and people just naturally have more opportunity and reason to drink. 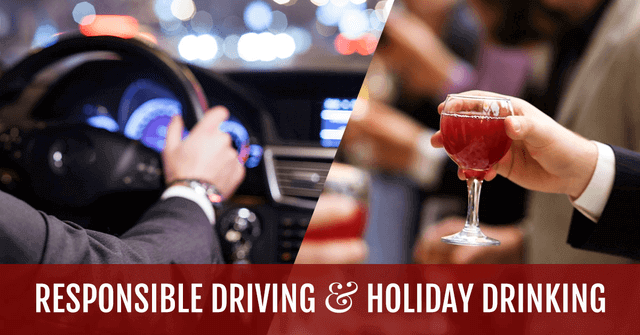 Many of the most dangerous days for drunk drivers on the road happen during the holiday season for different reasons, including depression and stress. Here is a breakdown of the worst days for drunk driving during this time of year. Many police departments refer to the day before Thanksgiving as “Black Wednesday” because there are so many drunk drivers on the road. Since most college students go on a break, they party before heading home. Others are drinking as they prepare food for Thanksgiving. Whatever the reason, this is a bad day for drunk driving. While this day isn’t known for being a drinking holiday, it is a day where people eat way too much food. With that food, comes a lot of alcohol. As one of the most traveled days of the year, people put themselves and others around them at a higher risk when driving around. Black Friday makes the third day in a row for a very dangerous week for travel. People celebrating with their families the day before, combined with all the shopping deals that start in the morning, those who drive under the influence increase in number. One of the most traditional days of the year includes more gathering, eating, and drinking. Most of the drinking occurs as Christmas Eve goes on, while dining, wrapping presents, preparing for the next day, etc. and don’t think before getting behind the wheel of a car. The longer New Year’s Eve goes on, the more drunk people become. It contributes to the number of New Year’s Day stats because people stay out partying well past midnight. New Year’s Eve is the day with the most arrests of the year. While you can’t control the actions of others, there are a few things you can do to keep yourself from drunk driving. They all wrap up into one main idea though; plan before you drink. Designate a friend to not drink who can drive everyone home. Arrange for a taxi, Uber, Lyft, or another driving service to pick you up at a certain time. Tell others your plan to ask them to help keep you accountable. Remind all the people in your party to not drive after drinking. You might save some lives. A little planning beforehand is all that is required to keep yourself, and everyone on the road around you, safe. If you don’t have a plan before you drink, you are more likely to make bad decisions. No one wants to spend the holidays in the hospital or mourning the loss of a loved one. All too often, that is what happens though when people choose to drink and drive. Make sure you aren’t the reason for sadness for your family or those on the road during the holiday season.